Planning a sketch outing in March is always iffy. Chances are good that it will rain, so scheduling an outdoor location would be pushing our luck. But chances are just as good that it will be warm and dry enough to sketch outdoors. At the Burke Museum on the University of Washington campus, we could hedge our bets: If the sun shone, the cherry blossoms on the Quad would be irresistible. If it rained, the Burke would be full of sketchable treasures. I can safely say that all 20+ (maybe close to 30?) Seattle Urban Sketchers chose to sketch inside the Burke this morning, resulting in many delightful sketches of dinosaurs and human history artifacts. 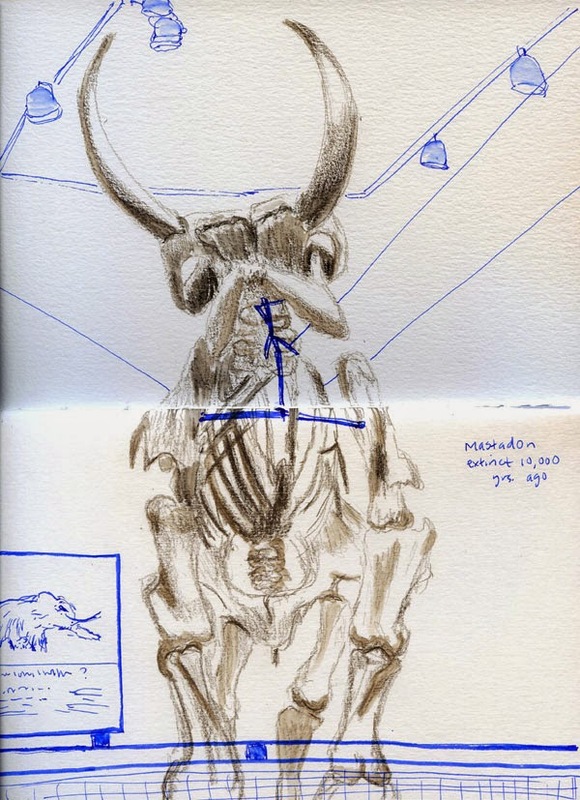 By now I think I’ve sketched all of the Burke’s complete animal skeletons in the regular exhibits (someday I’ll finish every skull, femur and other individual bones), including the enormous mastodon. The first time I sketched it was nearly two years ago. About a year ago, I sketched just its head and amazing tusks. Today I spent the bulk of my time sketching a slightly different angle of the mastodon, and instead of my favorite pen, I tried colored pencils. As usual, I didn’t scale my sketch accurately, so I ran out of room for its feet! 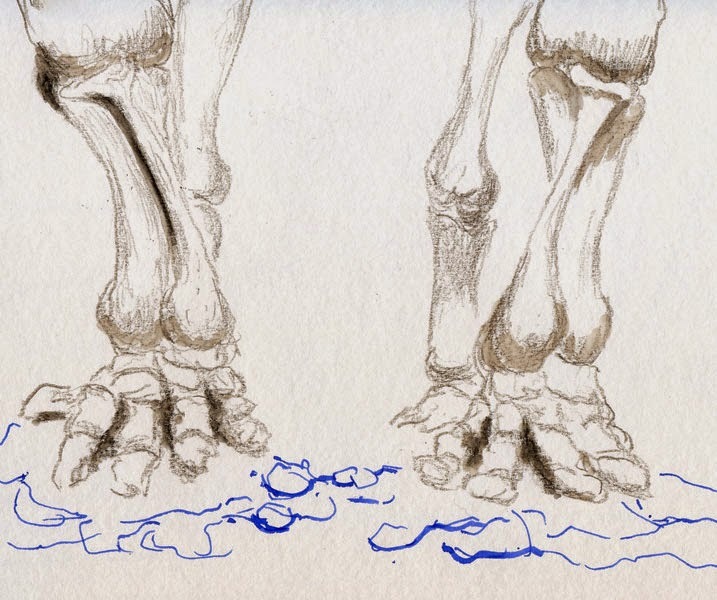 Like the time I sketched the stegosaurus and had to put its tail tip on a separate page, I decided to start a new sketch and give the mastodon’s feet equal time. To kill the last 20 minutes before our sharing time, I went out to the main reception area to sketch a long view of the Paraphysornis brasilienis. It may be one of my favorite prehistoric skeletons at the Burke; with a nickname like “Terror Bird of Brazil,” who could resist? 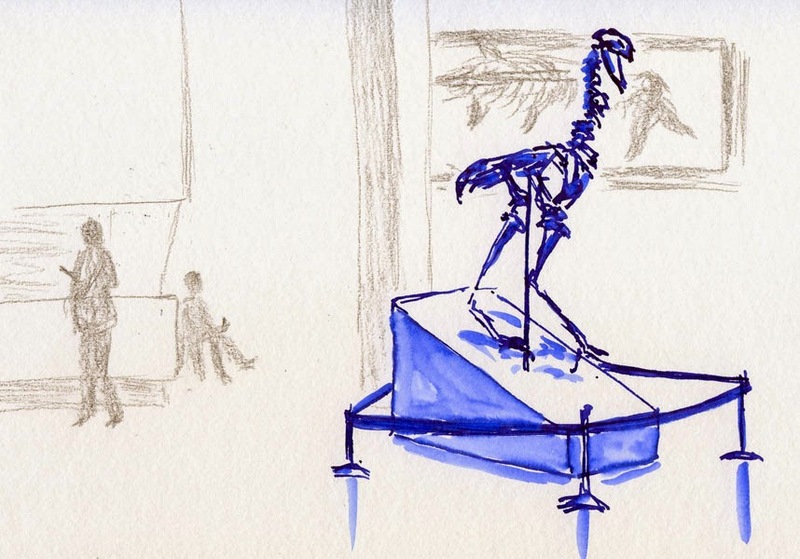 Many thanks to the Burke Museum for sponsoring Seattle Urban Sketchers’ visit today! 3/15/15 "Terror Bird of Brazil" in the Burke Museum's reception area. thanks for organizing it. Perfect for such a rainy day.